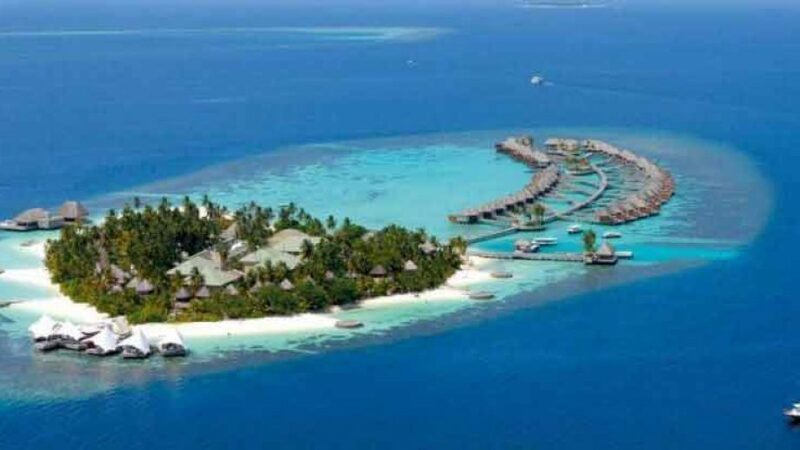 W Retreat Spa Maldives – Enjoy the sunny Maldives, sparkling Blue Ocean and soft white sandy beaches at the plush resort, W retreat and spa. 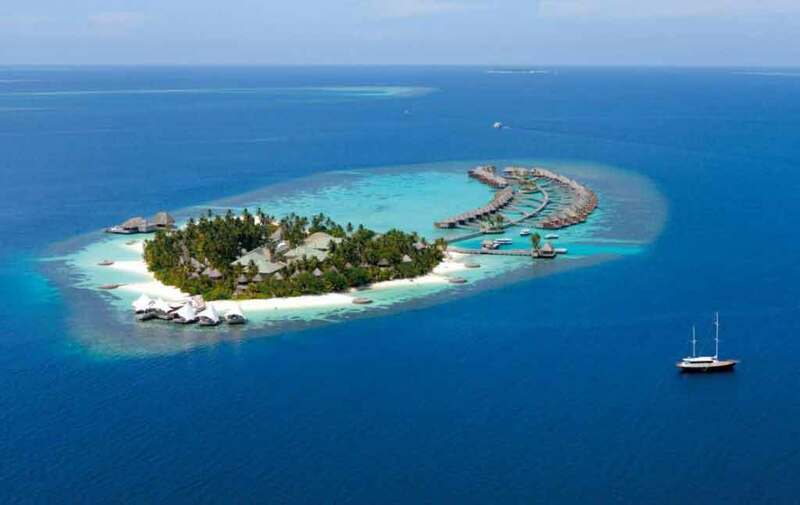 A contemporary exclusive resort, it offers an unmatched and unforgettable experience of a lifetime. Enjoy the white sand beaches, turquoise lagoons and breathtaking house coral reefs at the exclusive private island situated in North Ari Atoll. W retreat and spa offers 78 retreats ranging from wonderful beach oasis to spectacular ocean oasis to fabulous lagoon oasis to wow ocean escape. Each retreat is spacious and elegantly designed to meet the need and preferences of the guest. 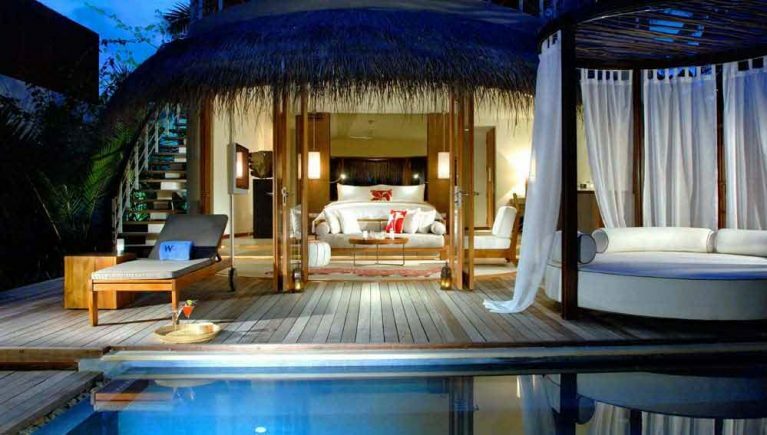 Each room comes with in-room amenities and facilities including a private plunge pool and sundeck. The resort features 6 restaurants and lounges for the hungry souls. Savor the taste of local and international delights that will melt your heart and tantalize your taste buds. Enjoy the only underwater nightclub in Maldives, 15 below at W retreat and spa. 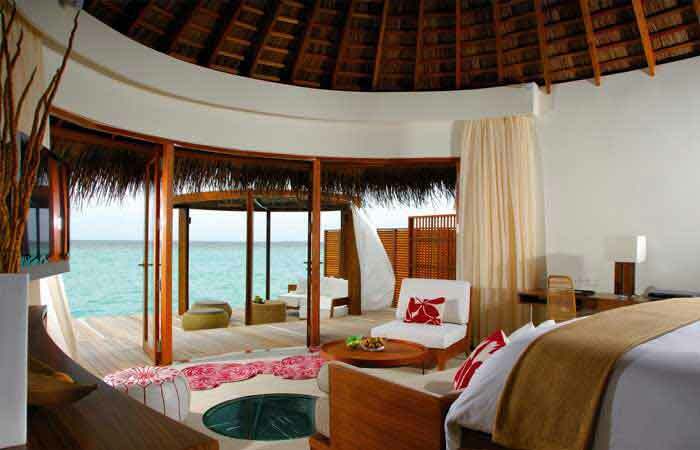 Enjoy the rejuvenating massages in the overwater AWAY spa. W retreat and spa is an ultimate luxurious escape. Where dreams come true. Transfer to Resort is via Seaplane from Male International Airport. Seaplane transfers are available during daylight only; 6 Am to 3:30 Pm. Guests under the age of 10 are not accepted at the Resort. Revitalize and live all the worries aside at the award winning spa, Away spa. The spa takes you away from all the hustle and bustle of daily life to serenity and tranquility. This 66 sqm spa has four luxurious spa treatment rooms, offering massages, Ayurveda treatment, body treatment, facial treatment for any skin type, hand and foot treatment. Nestled in lush retreat of the island, wonderful beach oasis is an ultimate retreat featuring a spacious outdoor deck with plunge pool and circular bed. This 118 square meter villa comes with all the modern amenities including plasma TV, BOSE® sound system, complimentary High Speed Internet Access, wine fridge. This 2 storey villa features a master bedroom with comfortable king size bed, outdoor bathroom featuring a standalone bathtub, rain forest shower. The villa features a swing daybed, fridge and BBQ area in the upstairs floor. 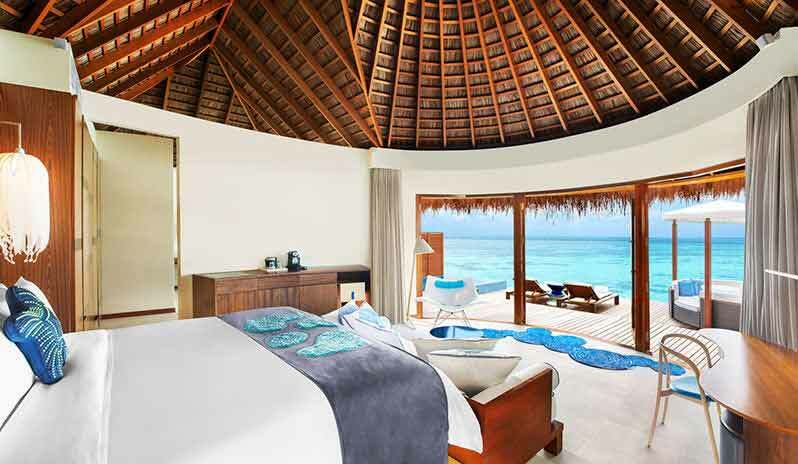 The villa features a panoramic view of the sparkling Blue Ocean and offer direct access to the chalky white beaches. 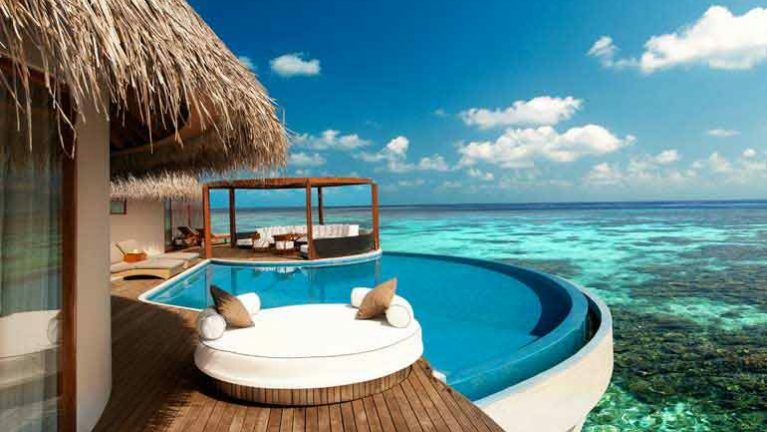 Perched over crystal clear ocean, fabulous over water oasis offers the ultimate seclusion. 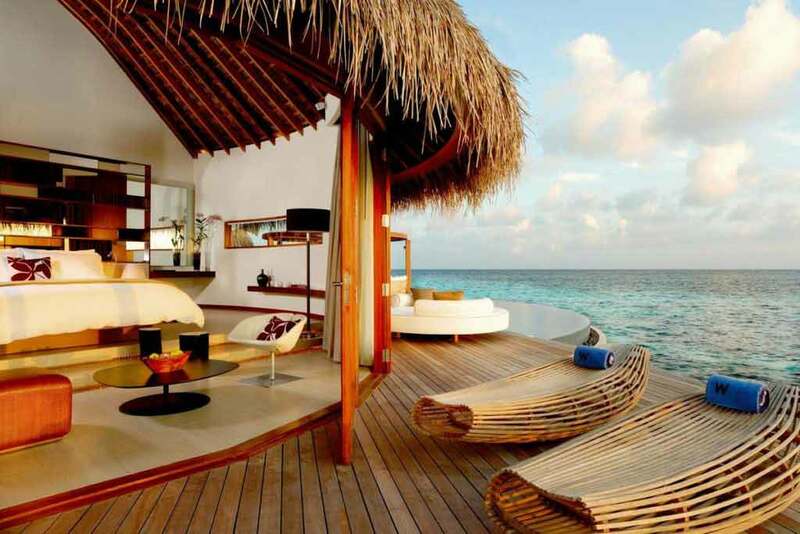 Enjoy the marine life passing through the glass bottom floor in this over water ocean villa. An ultimate luxurious villa this villa features a spacious outdoor deck with your private plunge pool and sundeck where you can bask in the sun and enjoy the unobstructed view of the ocean. This villa features modern amenities including plasma TV, BOSE® sound system, complimentary High Speed Internet Access, wine fridge. This villa features a master bedroom with comfortable king size bed, outdoor bathroom featuring a standalone bathtub, rain forest shower. Retreat back in the comforts of over water wow ocean escape. 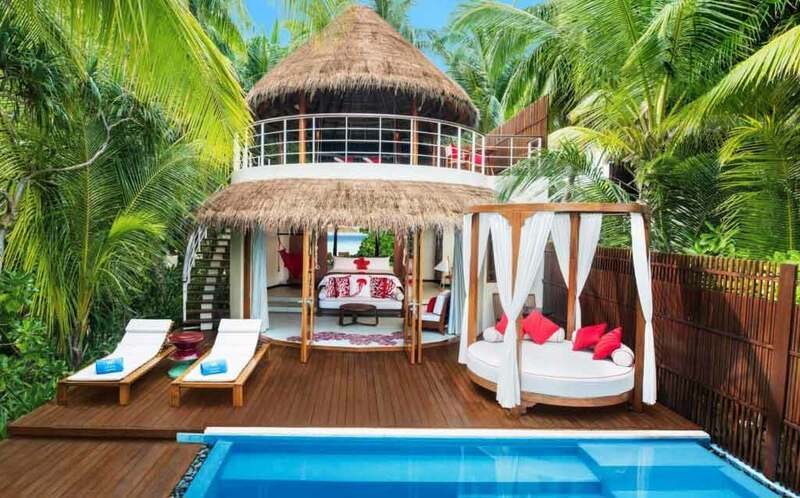 A private, secluded 2 bedroom villa, this villa offers direct access to the ocean. Spend your day swimming or snorkeling in the turquoise lagoon or relax and lounge in the comforts of sundeck. 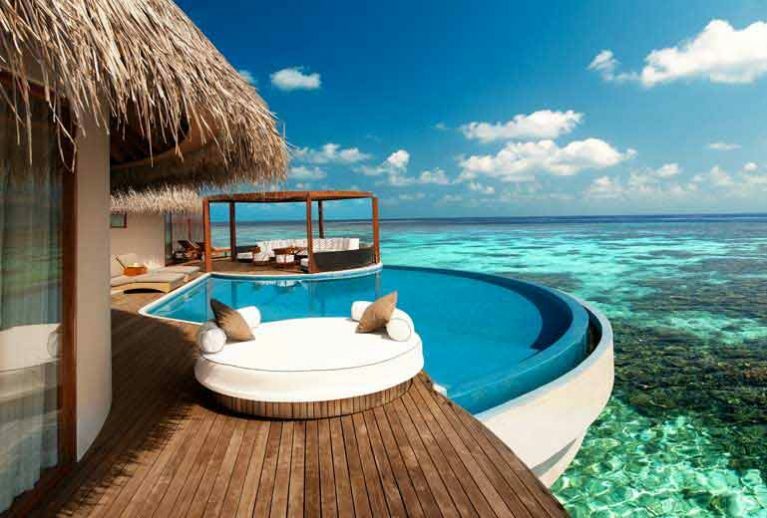 Swim in your private plunge pool or enjoy the ever changing aqua life from the glass flooring. Every moment will be well spent in this luxurious villa. This villa features modern amenities including plasma TV, BOSE® sound system, 50 inch plasma TV, complimentary High, Speed Internet Access, wine fridge. This villa features a master bedroom with comfortable king size bed, outdoor bathroom featuring a standalone bathtub, rain forest shower, dining area, living area. 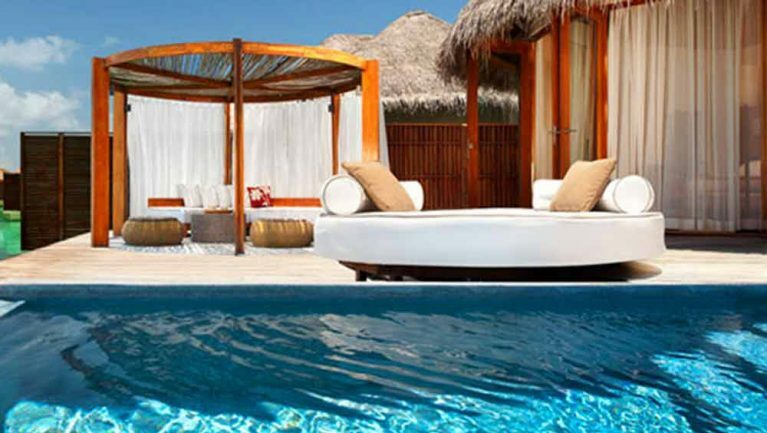 Extreme wow ocean escape haven is the ultimate cozy, plush, luxurious villas W retreat and spa offers. Dreams come true in this beautiful villa, perfectly set over the water in a perfect harmony with the nature. 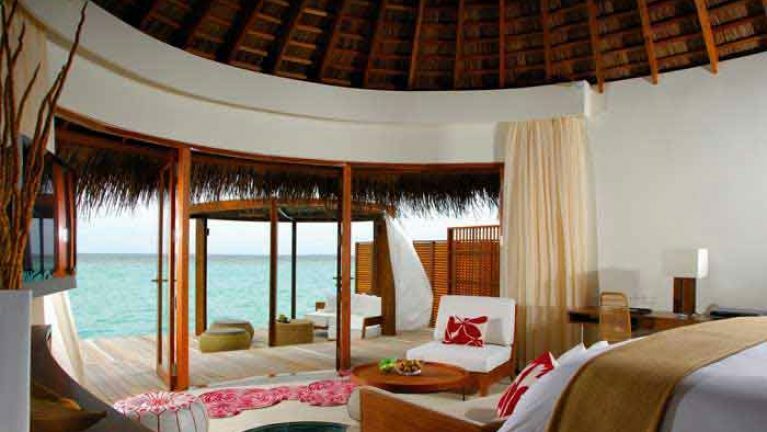 Wake up to the sounds of the invigorating waves in this rustic thatched roof villa. The villa has a vibrant ambience with extensive custom furnishing and amenities. The master suite features a king size bed, en-suite bathroom with oversized bathtub and bliss spa bath amenities. Offering an unobstructed view of the lagoon, this villa features a 42 inch plasma TV, wardrobe for him and her, IDD telephone. The junior suite is a sea facing suite featuring twin beds, en-suite bathroom, 42 inch plasma TV, and wardrobe for him and her. Enjoy the airy living area featuring a 50 inch plasma TV and Bose hi-fi set, kitchen area and outdoor deck. Enjoy the ever changing marine life and spacious outdoor deck in the extreme wow ocean Haven. The only underwater night club and bar, dance to the tunes of DJ at fifteen below. It’s a perfect place to get your dancing shoes out and party hard with friends. Enjoy the encapsulating view of the sunset while sipping tropical cocktails, mocktails, chilled beer, extensive wine and champagnes at Sip. It is an outdoor bar with mesmerizing sunset, cool breezes and serving freshly prepared oysters, sushi, caviar and many more alongside beverages. Experience barefoot dinning at Fire. Fire is an specialty restaurant serving meats and seafood cooked to perfection at barbecue grill. Enjoy the tenderness of spit-roasted lamb or suckling pig. The restaurant also has an open tandoori, taste naan bread, chicken tandoori with variety of curry dishes to go along with. A pool bar, chill in the gourmet lounge sipping signature cocktails and mock tails, chilled beverages and other non-alcoholic beverages. Wet also serves light main courses, wood-fired pizzas, delicious burgers, generous salads, scrumptious Asian cuisine. An open air restaurant perched over the Indian ocean, this specialty restaurant serves freshest sea food. The favorite place for sea food lovers and couples, enjoy the perfect setting of the endless ocean as the backdrop. Kitchen is an all-day dining eclectic restaurant serving gastronomical delights with pleasing environment and ambience. Soul satisfying simple dishes are given one of a kind twists that you’re surely going to love. This semi-formal restaurant has an open cooking station so guest can see food prepared right in front of your eyes. Enjoy dining under the stars in Uninhabited Island, or near the shoreline of the beach listening to soothing rhythm of the lapping waves or in comforts of your private villa or on a private yacht. Choice is yours. Accepts guests above 18 Yrs. only.